The overall aim of the course is to equip mediators (those with an initial recognised mediation qualification) to be competent to work in the specialist area of SEND mediation, and to be able to apply to the College of Mediators and the Civil Mediation Council for registration as a specialist mediator in SEND. The aim of the course specifically is for participants to gain awareness, knowledge, and experience of Special Educational Needs and Disability legislation, context, and local processes and procedures, as well as relevant mediation skills. Why Study with Global Mediation? Established in 1999, Global Mediation is widely recognised as the leading SEND Mediation provider in the UK, offering high quality, fully audited and accredited mediation services, and an extensive range of education and training programmes. We currently work in over 50 Local Authorities across the UK, and boast a panel of more than 30 qualified, experienced and dedicated mediators, with 3 additional In-House Specialist Mediators, all of whom are supported by a team of permanent office staff in our North London based offices. Most recently, we have engaged in a period of pioneering project work in partnership with the DfE, the College of Mediators and the Civil Mediation Council, in order to produce our innovative, SEND Mediator Training Course; successful completion of this course is now required to achieve validation from the Civil Mediation Council and the College of Mediators in order to then qualify and practise as a specialist SEND mediator. Within our profession, the move to become accredited, whilst supported by the Government and the DfE, is a hugely positive step, and one which we are enthusiastic about – and fully committed to. 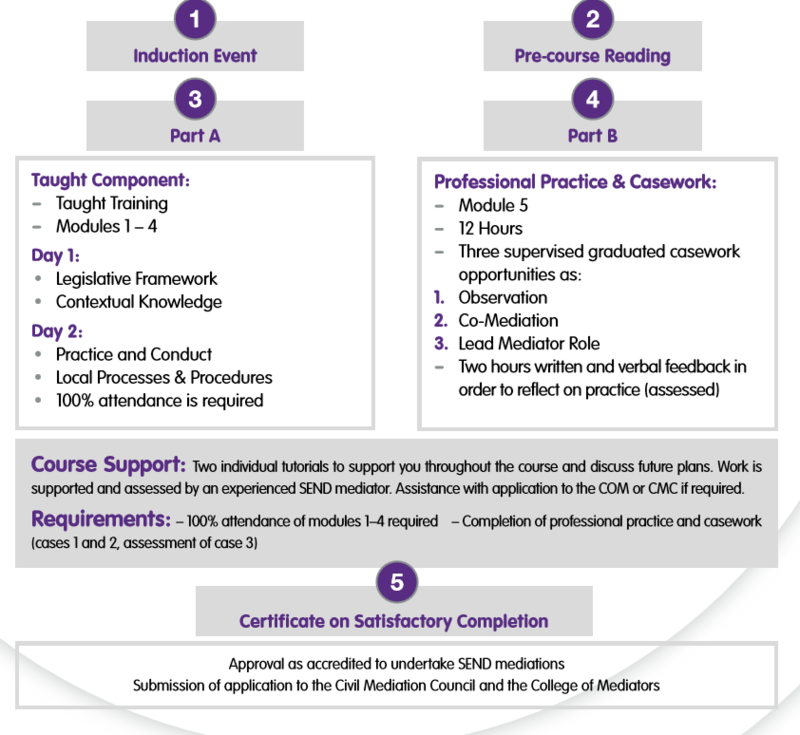 Completing a training course in SEND Mediation at Global Mediation will equip you with the necessary knowledge, skills and understanding required to practise as a specialist SEND mediator. You will also be able, where necessary, to apply to the College of Mediators and the Civil Mediation Council for membership. Who is the SEND Training Course for? The course is aimed at professional mediators with an invested interest in mediating disputes within the field of Special Educational Needs and Disability. Mediation practitioners applying for the course will need to have attended and be able to evidence successful completion of a foundation course in mediation. • Taught component: 4 modules over two days. • Module 5: Professional Practice and Casework consisting of 3 graduated casework opportunities (mediation observation; co/mediation and lead mediation practice) organised and supervised. Completion of Module 5 will usually take between 3-12 months following the Taught component of the course, dependent on individual circumstances and tutor availability. • Assistance with preparation of your application to be submitted to the CMC and CoM if needed. • Access to an online safeguarding course with the NSPCC is advised. The £20 fee is payable separately to the NSPCC. • Certificate upon completion of the course. Fees are refundable in full if cancelled 28 days prior to commencement of the course. 50% of the fees are refundable if cancelled 7 days prior to commencement of the course. In exceptional circumstances deferment of date may be agreed at the discretion of Global Mediation. Travel expenses are not included, and you may be required to travel to mutually agreeable locations to complete the Professional Practice Mediation sessions. Please note that this information is for guidance only, and is subject to change. The taught component will be held at the venue detailed below. Travel expenses are not included, and you may be required to travel to mutually agreeable locations to complete the Professional Practice Mediation sessions. The Radlett Centre is easy to get to by car within a few minutes drive from the M1 or M25. Parking: The nearest car park is Newberries Car Park, situated directly across the road with 210 spaces. The car park is free after 6.30pm every evening and all day Sunday, and ‘pay and display’ at other times. There is a regular Thameslink service to Radlett, with links to St Albans, Luton, & London Kings Cross. The station is a two minute walk from the Centre. Passenger enquiries 08457 484950. 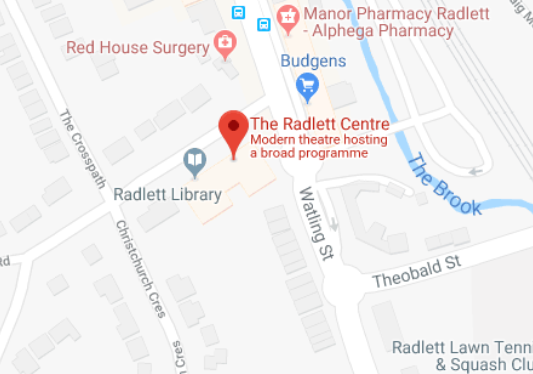 Access: The Radlett Centre can be easily accessed by wheelchair users. To register your interest or to request upcoming course dates, please contact us at: sen@globalmediation.co.uk We will send you an application form which you will be asked to return with your CV, a covering letter and details of your mediation certification. The interview will be conducted by at least one of the course leaders. It is an opportunity for us to find out what has motivated you to apply for the course, and for you to find out a little more about the course content, the course staff and what to expect upon successful completion of the course, and finally to establish whether the course is right for you. Interviews will be conducted via telephone or teleconferencing, by arrangement. Applicants are encouraged to share with us any individual or specific needs with regard to this training, so that consideration can be given to providing support, reasonable adjustments, or other assistance. 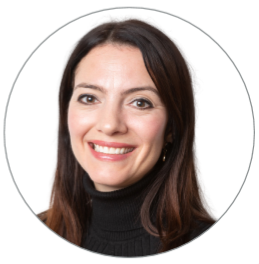 Polly Walker is an accredited mediator, having joined Global Mediation as a panel member in 2014, moving to the role of In-House Mediator during 2018. Polly’s area of expertise resides in special needs education. Originally training as a primary school teacher, she transitioned to a career focusing on special educational needs, working closely with children and young people presenting with a range of special educational needs, and their families and relevant professionals, within a variety of educational settings. She is committed to all matters of social inclusion and as a result, became a published author, having written and illustrated two children’s books with themes around diversity, self-esteem, and conflict resolution. 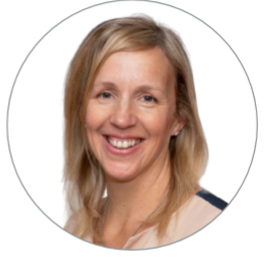 Polly is extremely passionate about mediation, viewing the process as a valuable opportunity for empowerment, cohesive problem solving and the development of positive communication and mutual understanding. She is highly regarded for her approach – she is professional and assertive, yet warm and engaging, and wholly committed to fairness and neutrality. She has extensive experience of mediating SEN disputes, as well as workplace and community disagreements. Polly is recognised as an accredited SEND Mediator, awarded by the College of Mediators and the Civil Mediation Council. 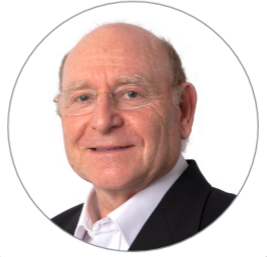 Emeritus Professor Irvine Gersch is the past Director of Programmes in Educational and Child Psychology at the University of East London. Prior to this, he worked as a teacher, an Educational Psychologist and Principal Educational Psychologist. He has been on the Board of Global Mediation since the Company’s inception and now works as a Consultant, with special responsibility for training, quality assurance, safeguarding and business development. He is widely published on subjects including: school leadership and management; listening to children and behaviour management; parenting; mediation and conciliation in special educational needs; the future of SEN and psychology; and coaching and mentoring. He has acted as advisor for the Government in SEN and has received two annual awards from the British Psychological Society for distinguished contributions to the profession of educational and child psychology in 2002 and 2016. 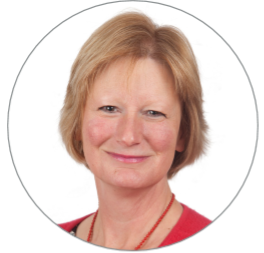 Irvine is currently a member of the College of Mediators and the Civil Mediation Council Panel of Assessors, having served on the DfE working party, developing standards and training for SEND mediators. Irvine is recognised as an accredited SEND Mediator, awarded by the College of Mediators and the Civil Mediation Council. Martha has been on the Global Mediation panel as an accredited mediator since its inception in 1999. In April 2016 she was assigned the role of In-House Mediator and in April 2018 became Acting Director. As well as carrying out direct mediations in all regions, her role involves local authority liaison, marketing and training. Martha has extensive mediation experience, having been mediating on a regular basis since 1998. She practised simultaneously as a family law barrister for 16 years and has a Masters in Law, but has recently resigned from the Bar to concentrate upon her mediation practice, preferring the investigative, empowering and nonadversarial approach offered by this process of dispute resolution. Assisted by her honed listening and negotiation skills, she has an exceptional track record of successful mediations. Martha conveys a degree of empathy, whilst remaining alert to the needs of all participants to find fair, practical solutions. Martha is recognised as an accredited SEND Mediator, awarded by the College of Mediators and the Civil Mediation Council. Karen was appointed In-House Mediator with Global Mediation in June 2017. She has been on the Global Mediation panel as an accredited mediator since 2014. She mediates across the country and her role also involves local authority liaison, marketing and training. Karen has always had a passion for conflict resolution. She qualified as a solicitor, but has spent the majority of her career in the charity sector. More recently, she has held appointments with professional regulatory and other bodies where she chairs hearings to decide on whether an individual is fit to practise or whether his or her actions amount to a breach of professional standards. Karen is a mediator who inspires confidence and encourages parties to engage, with her warm and professional approach. She believes that mediation provides a way for parties to take control of their own dispute, within the safe space created by the mediator, and to find a mutually acceptable outcome, avoiding potentially costly and protracted legal proceedings. Karen is recognised as an accredited SEND Mediator, awarded by the College of Mediators and the Civil Mediation Council. 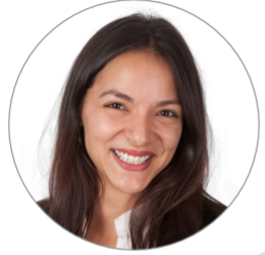 Chantelle joined Global Mediation in July 2016 as a Case Manager. She has an NVQ Level 3 in Business and Administration and was previously working for a law firm in an administrative role.